Baseboard heaters unlike wall heaters are not plug and play devices. They are hardwired to a house’s electric line. They generally run on electricity. The heating elements are contained in cabinets that are installed at the baseboards of rooms. They are controlled by thermostats in each room. 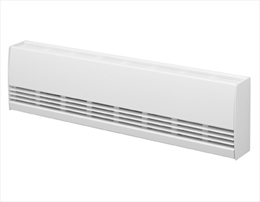 How do baseboard heaters work? 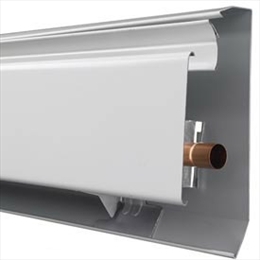 Traditionally, baseboard heaters had electric heating elements enclosed in metal pipes. The pipes had aluminium fins surrounding them. The aluminium pipes and fins were used for heat transfer. These fins would run the entire length of the baseboard heater's cabinet. The heater would draw air from the bottom. As the air in it gets heated by the fins, it rises up into the room. Some of the heat is also radiated from the pipe, fins, and housing. The functioning of electronic hydronic baseboard heater is slightly different. Inside these heaters there are heating elements that can run on oil, gas or electricity. Once you power on the heater and set a temperature on the thermostat, heating begins. The heater has tube that is filled with water and run the entire length of the heater. The tube and the water inside it become hot due to the heating. The water turns into steam and then heats air before it circulates throughout the room. •	They have low upfront cost. You need neither a duct work nor an expensive furnace. •	Each baseboard heater of a house would have its own thermostat. So you can control the temperature in each room according to the need. This also helps to save energy. The central heating systems are controlled by one thermostat. As result the house is never evenly warm with cold spots here and there. •	The heat distribution is more even and fluctuation of temperature is less, especially in case of hydronic heaters. •	Hydronic baseboard heaters are much cleaner. •	Baseboard heaters can be costly to run for a prolonged period of time. •	Electric baseboard heaters cannot heat up rooms instantly as central heating systems. •	All models of baseboard heaters may not provide good temperature output. •	These units do not have any moving part. They offer you whisper-quiet operation. You cannot hear any sound except for the thermostat’s ticking" when heater turns off as the set temperature is reached. •	These heaters do not blow air. Thy heat through convection. As a result they do not bring dust, pollen, and other pollutants--around the room. They are more suited for houses with sick people or people allergic to pollutants and dust. •	Central heating systems are often hidden in places like the attic or a closet. Electric baseboard heaters are visible throughout your house; this may affect the house’s decor.